NEW YORK—Kudos to actress Kathryn Erbe for bringing to life one of the most unlikable, annoying, and memorable stage characters in recent memory. Her performance makes playwright Craig Lucas’s latest work, Ode to Joy, worth watching. 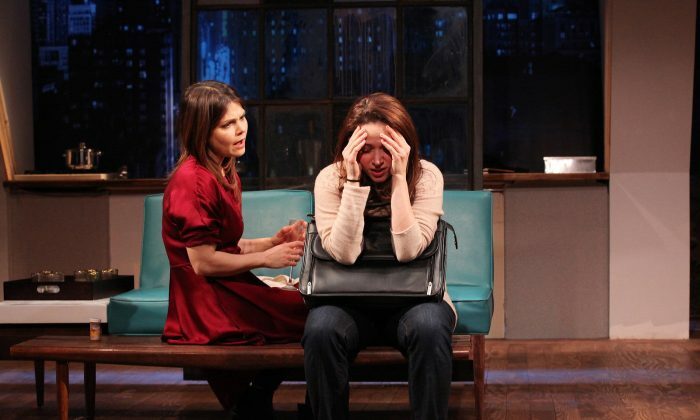 The play, presented by Rattlestick Playwrights Theater, offers an intense look at one woman’s self-destructive journey, though Lucas never seems to be sure whether the journey should be comic, dramatic, or something in between. Taking place via flashback and spanning a 15-year period, the story begins with Adele (Erbe), who’s reeling from a messy breakup, running into Bill (Arliss Howard) in a New York City bar. As the evening progresses, the two bond over an unmistakable chemistry, helped along with a liberal intake of alcohol and a bit of Ecstasy—the latter courtesy of Bill. Over the next few hours, the two adopt a puppy, Bill asks Adele’s father for her hand in marriage, and Bill and Adele severely injure themselves, thanks to several drunken encounters with broken glass. Not only is Adele a drug- and alcohol-abuser, she’s also a habitual liar, and the only time she works on keeping sober is when she immerses herself in a relationship with another person—at least in the beginning. A case in point is Mala (Roxanna Hope), who Adele is getting over when the play begins. Adele had taken care of Mala during her illness and subsequent heart surgery. That is, until Adele’s substance abuse binges resurfaced and became more important than anything else. Even much later, when Adele becomes a member of AA and tries to make amends for past mistakes, she’s still unable to come clean about what she’s done. Rather, she’s always trying to shade her apologies with explanations, excuses, and blame deflection. Lucas presents an interesting scenario, but his script never fully explores the possibilities, leaving one somewhat adrift as the scenes and years keeping changing without establishing an emotional link to the various characters. More telling, we’re never shown just how or why these people face their respective demons. Instead, the tale leapfrogs over key incidents and fills in the blanks with quick explanations. This weakness also translates to a chronic characterization problem. Adele, for example, isn’t given enough of a back story to make one really care about her. Knowing what made her an addict in the first place would certainly have made the character more interesting and if not more sympathetic, at least more understandable. Bill is certainly an unpleasant fellow, at least initially, having his own struggles with addiction. Yet because we only see him through Adele’s eyes, we never get to understand who he is on his own. While Mala’s condition definitely arouses sympathy, all we know about her is that she’s rather paranoid about the Y2K millennium bug and has a strained relationship with her family. Indeed, of the three characters in the story, she’s actually the least developed. Mala is also more than a little arrogant at times, but then again so are Adele and Bill, leaving no one to really root for as the play progresses. As mentioned above, Erbe does a great job with her role, making the rather messed-up Adele alternatively quite attractive and an object of scorn and pity. In fact, one can’t help but hope both Bill and Mala get as far away from Adele as possible. Howard is fine as Bill, probably the one character who changes the most over the course of the story. It also helps that Howard and Erbe have excellent chemistry together, be their situation intimate, comedic, or hostile. Hope is okay as Mala, though her first meeting with Adele comes off as stilted and not that believable. Lucas also serves as the director here, and while his efforts enable the scenes to move along nicely, he’s unable to make the entire effort rise above the problems in the script. One also wonders why Adele tells the audience that they’re beginning the final scene of the play—a narrative point unnecessary to announce. Andrew Boyce’s sets of the various locations are fine, and Paul Whitaker’s lighting nicely helps to establish the different moods presented. Costumes by Catherine Zuber work well. A tale with potential, Ode to Joy doesn’t come together as it should; the playwright never really brings the “why” of the characters to the forefront of the story.